Eight members of a family-run drugs gang who supplied up to £2.5m worth of cocaine have been jailed. They distributed about 42kg of cocaine in Newport between July 2016 and June 2018, the city's crown court heard. 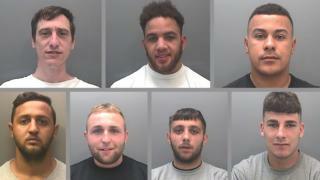 The judge said each of them played a role "trading in a vile drug". Half of the gang, led by brothers Jerome and Blaine Nunes, were jailed on Friday. Eight others, including the pair's mother Angela Collingbourne, 51, will be sentenced at a later date. They were arrested following a year-long police investigation which involved surveillance and secret recordings. Initially, the gang operated out of a garage called NP19 tyres which prosecution barrister Andrew Jones described as a "front to launder money from drug dealing". Video recording showed thousands of pounds passing through the premises while only a handful of cars were being repaired. Central to the organisation was a mobile phone called "the Jez line" which was the main point of contact for customers. On average, 267 contacts were made with the phone line each day, with more than 4,000 different numbers contacted over a two-year period. The Nunes brothers were convicted of conspiracy to supply a class A drug between 31 July 2016 and 15 June 2018 following a trial. Six other defendants pleaded guilty to the same charge. The judge said it was one of the most "depressing features" of the case that Jerome Nunes was able to direct the operation from his prison cell using hidden mobile phones. He was already serving a seven year, eight month sentence for possession of cocaine with intent to supply. He will now serve an additional 12 years. Blaine Nunes was sentenced to 14 years, to run consecutively with a sentence of four years and eight months he is already serving for causing death by dangerous driving. The convictions come after 120 officers from Gwent Police and Tarian, the regional organised crime unit for south Wales, conducted a series of raids in Maindee and Alway in Newport. Det Ch Insp Julian Bull said: "It is good to know that these criminals are now behind bars and unable to continue profiting from the misery their trade brings to our neighbourhoods." Iwan Jenkins from the CPS said the investigation showed the group was "well organised, with each person having their own role to play".